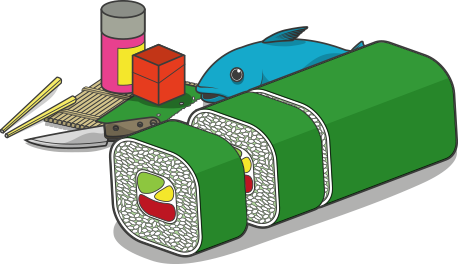 As we all know, sushi is often – but not always – prepared with raw fish. It doesn’t sound very appetizing, but before you start working with raw fish, you need to know a few things about parasites, how to prevent them and how to destroy them. You also need to know some things about ‘sushi grade fish’ and how to tell is fish is fresh. Chef Devaux explains it all in this video about sushi grade fish. As usual there are also written instructions that go with the video. Be aware: part of this lesson involves studying a document with guidelines on destroying parasites and a document that informs you which fish pose possible parasite risks. Chef Devaux recommends you really do download those documents and take the time to study them. Print both documents and keep them available in your kitchen. You don’t need to learn it all by heart, but it is information you’ll be needing regularly. The Chef wants to stress that this subject is very, very important. Eating raw fish can be perfectly okay as long as you know what you’re doing. When in doubt, always look it up! After all, the last thing you want is making your guests or yourself sick by serving them fish or seafood that’s not suitable to eat. One more thing about telling is fish is fresh. As Chef Devaux explains in the video, this requieres taking a close look, smelling the fish and touching it before buying it. This may be a problem. Chances are many fish sellers won’t allow you to do all that. This is understandable since you don’t want fish that has been touched by a number of previous customers. There’s also the subject of trust. You may want to ask the seller is the fish is fresh, but most of the times the reply probably will be: of course it’s fresh! Demanding you’re allowed to test that for yourself may result in a quarrel with the seller. The best you can do here is use common sense. If you want to test the freshness for yourself, first ask if that’s alright. But don’t immediately distrust the seller if you’re not allowed to touch the fish before buying it. It may be simply too busy to let every customer extensively test for freshness. Or they simply don’t want all those different hands touching the merchandise, all of which is completely understandable. The best you can do in that case, is take a good look from as close as you can. If you decide to buy the fish, test for freshness at home. If you find out that it’s not fresh, don’t eat it anyway, not even after cooking it. Fish that has gone bad will never taste good, no matter how you prepare it. But do make a point of going back to the seller and complain. Or simply don’t go there again and choose a different seller.